Advantage Environmental Corp. is devoted to delivering customer-friendly Used Oil Filter Reclamation service to our clients. 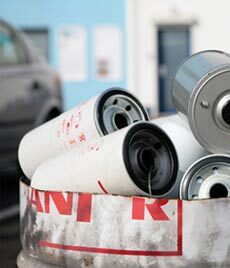 We are a company that is committed to recycling used oil filters. The Used Oil Filter Reclamation service involves collecting used engine oil filters from automobiles, machines, and other heavy equipment. They are crushed, bailed and the metal recycled to be reused in the future. We turn waste into a resource of great value using safe and reliable recycling facilities. The company assures you with on-time pickups of the used oil and other waste materials. We also guarantee environmental-friendly processing of these waste materials according to state and federal regulations. The facilities we use for the reclamation process are regularly tested, inspected and maintained to certify high quality and safe outcomes. We are also responsible for accomplishing the necessary chain of custody documents regarding the disposal and recycling of these waste materials. From oil filters to glycol, to oil contaminated solids and used oil, Advantage Environmental has a full range of services that involves efficient recycling for a safer and better environment. Since the start of 2008, we were able to expand our services and add this service to be of utmost help to our clients who share the same environmental advocacy with us. Our friendly customer support will help you assess your used oil reclamation needs. The team will also be responsible in establishing the right reclamation or recycling program for you in order to comply with the government standards regarding proper disposal of used oil. If you have any inquiries, please contact our customer support via phone or fill out our Online Contact Form provided in this website.